On the edge of an very Italian village, in the heart of Umbria, the most frazzled parents can completely unwind at Casa Delle Grazie. 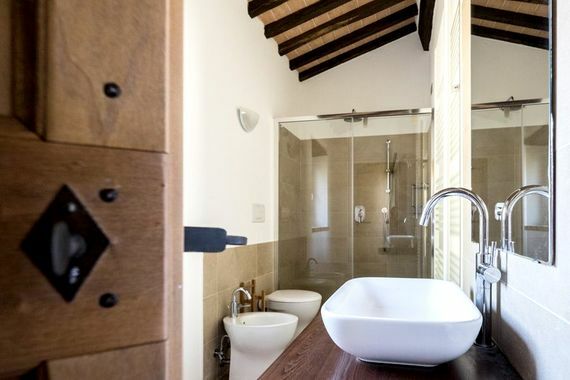 The owners have lovingly created three cottage apartments on their small holding and go to great lengths to make life completely easy and enjoyable for the whole family. 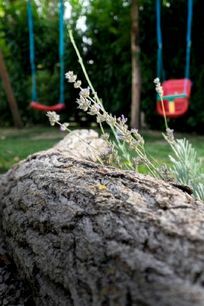 Happily occupied toddlers are half the battle and the owner’s rabbit run, a playground and pool are a pretty good start. The apartments have their own garden terrace with shady pergola to relax in private, comfy outdoor furniture and a bbq is also provided. Guests are also welcome to enjoy the house gardens, with glorious views from the pool plus a small veg patch where guests are welcome to sample any ripened vegetable. Dotted around the property are wonderful fruit trees, figs, cherry, apple and walnut. To the front of the property there is a field where the owners grow raspberries and guests are free to pick them when in season. Pre ordered meals can be ordered and private catering can be arranged. 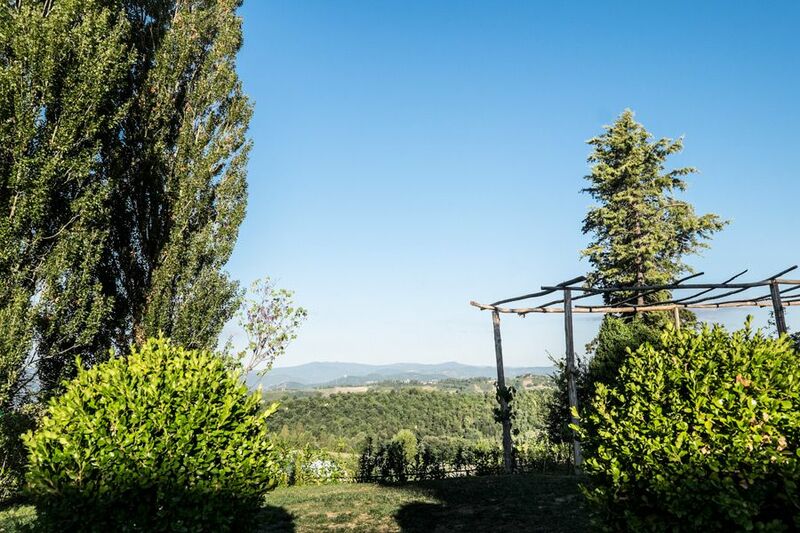 Through the summer, guests are invited for an aperitivo so they can sample some local salami and cheese and also get to know the other guests. From time to time local produce such as olive oils and jams are available. There is also a library of books, DVD’s and CD’s for guests to borrow. A babysitting service is available and complimentary welcome packs are provided so you sorted for breakfast the next morning. Casa Delle Grazie is just a 5-minute walk from the village of Montone and there is loads for families to see and do nearby but as evening falls, the apartments offer all the welcome comforts of home. 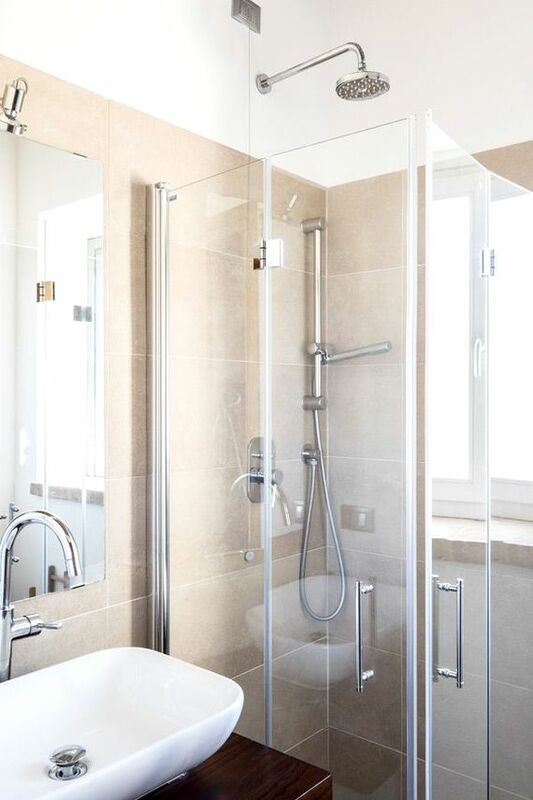 TV, DVD and CD players, Ipod dock and free wifi has the home entertainment sorted, the kitchens are well equipped for self catering and the simple, comfy bedrooms are ensuite. After a good night’s rest, a new day of exploring Umbria awaits, from the beaches of Lake Trasimeno to unmissable Assisi to the chocolate factory in Perugia! 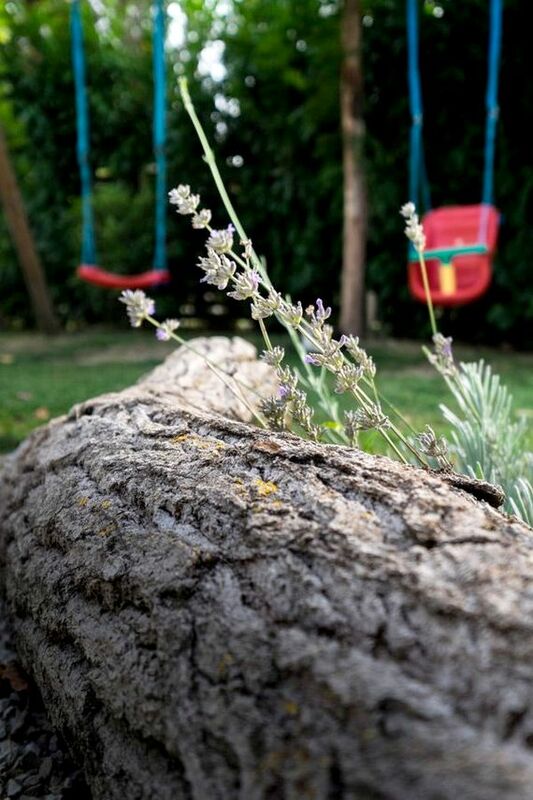 Mums can also recharge body, mind and soul in the small Spa of Hotel Fortebraccio located in the village of Montone. La Stalla (The Stall) sleeps 4-6 and is all on the ground floor for easy access with a pram or pushchair. There are two double bedrooms which can be set up as a superking or twin and both have space for a cot and have their own shower room/wc. The living/dining room has a double sofa bed (orthopedic) and the apartment has a fully equipped kitchenette. 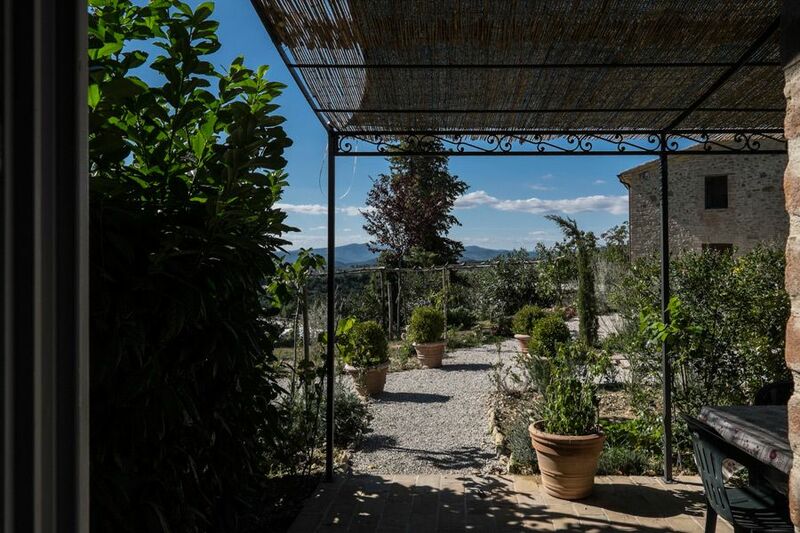 La Stalla also has access to a private terrace garden with deck chairs, parasol and outdoor dining furniture. 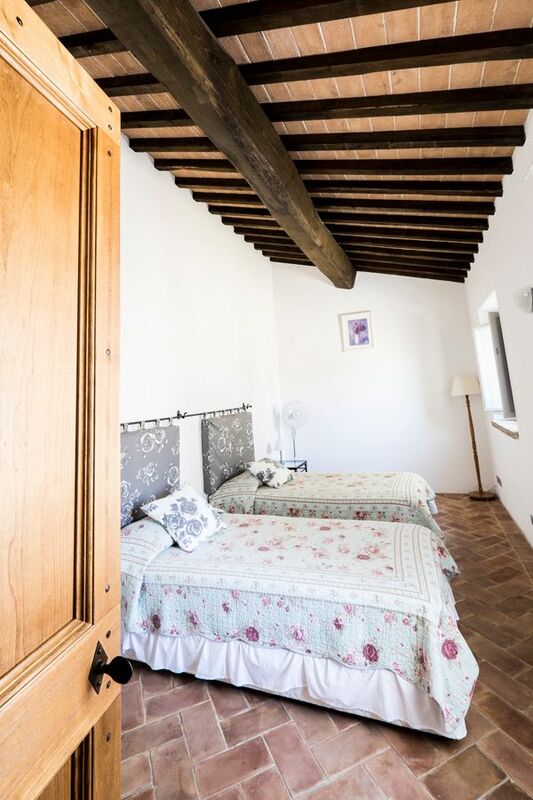 Casa Delle Grazie is just a 5-minute walk from Montone where there is a choice of child friendly restaurants to sample yummy Umbrian food. Umbertide (5 minutes drive) is a sizeable town to stock up on supplies and provisions, with a bustling market every Wednesday and an organic farmers market every Saturday. 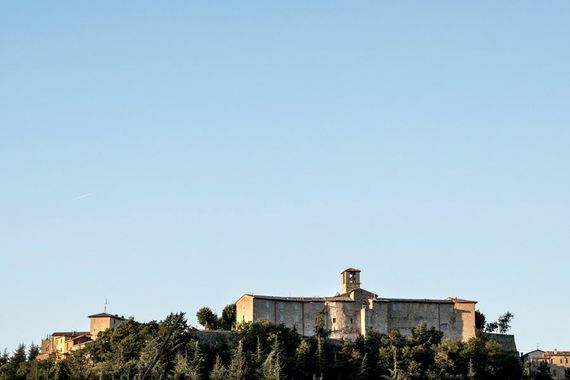 The capital of Umbria, Perugia (25 minutes drive), is an historic university city, renowned for its annual jazz festival and Bacci chocolates, with tours of the Perugina chocolate factory likely to be a hit with wannabe Willy Wonkers! Assisi (30 minutes), with its mighty basilica in honour of St Francis is Umbria’s tourist mecca and the Gubbio (20 minutes) is one of the most famous medieval hill towns. 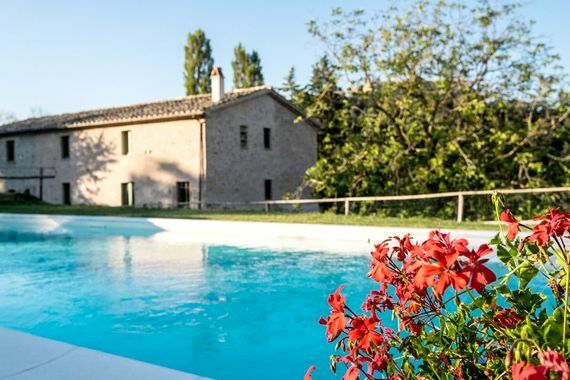 Casa Delle Grazie is surrounded by stunning Umbrian scenery and beautiful Lake Trasimeno (25 minutes) has nine public beaches for perfect family picnics, paddling, swimming and watersports. There are also boat trips to the lake’s islands and good fish restaurants to try. 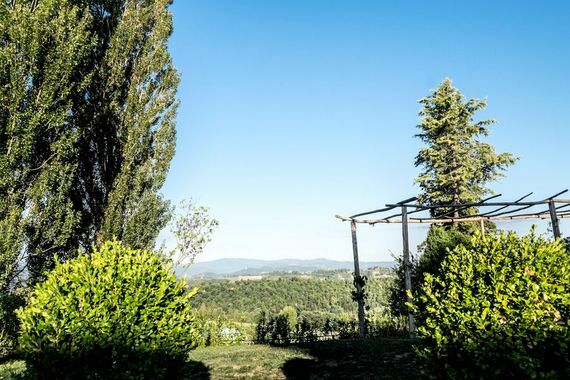 To indulge in Umbria’s famous delicacies, foodies staying at Casa Della Grazie can go on guided truffle hunts, have a sheep’s milk cheese tasting in Montone, visit a goats cheese farm in Val di Mezzo and quaff the wines in local vineyards. Other things for families to see and do include the spectacular Frasassi Caves, the Mirabilania theme park, Meridiana Alpaca Farm and Parco del Sole wildlife park. Getting there: Perugia (25 minutes) is the nearest airport and Ryanair offer flights from London Stansted. Other airports with flights from the UK include Ancona (1½ hours), Florence (1½ hours) and Pisa (2 hours). July 21-28 - Cancellation Offer - 10% Off! 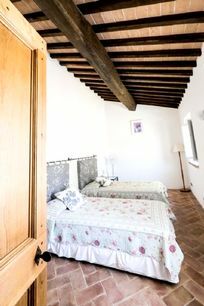 Sleeps 4-6+infants in 2 bedrooms both either super kings or twin bedrooms with space for a cot and 1 sofa bed in lounge. : Perugia (25 minutes) is the nearest airport and Ryanair offer flights from London Stansted. Other airports with flights from the UK include Ancona (1½ hours), Florence (1½ hours) and Pisa (2 hours). Casa Delle Grazie is only 20 minutes drive from Lake Trasimeno which has a vast array of activities and 9 public beaches. 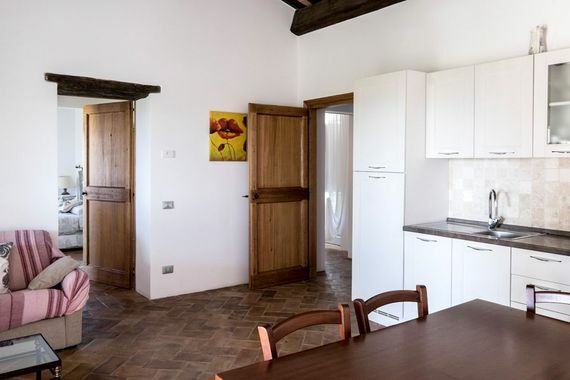 The cottages are 5 minutes walk to Montone Village which has child friendly restaurants. There is a shared, fenced and enclosed swimming pool for guests use. A catering service is also available. Baby gear available on request; Cots both wooden and travel size, 2 highchairs, a baby bath, a baby bouncer, baby monitor, steriliser, stairgates, bed guards, socket covers, and plastic crockery. For indoor play there are children's toys, books and U-rated DVDs. For outdoor play there are ride-ons, trikes, swing set and play house. 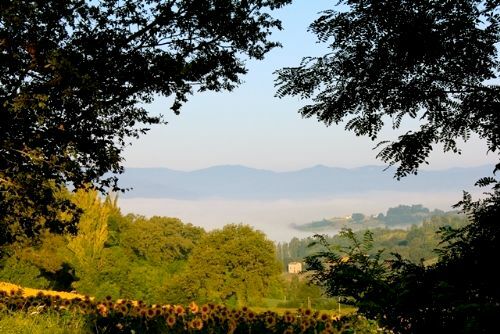 Antognolla Golf Course is an 18 hole Robert Trent Jones II championship golf course situated in the heart of Umbria, only 5 minutes drive from Casa delle Grazie. 1 wooden and 3 travel cots. Fantastic find. Tucked away just outside an almost unspoilt village with some lovely restaurants. Aine is a brilliant host and couldn't be more helpful, with two kids of her own she has everything you need including even an invite to an impromptu birthday party for her daughter. We were honoured. A wonderful week! !